Defenders move around all the time. Defenders move around more than ever. Different places categorize different alignments differently, and it’s not clear where you draw the line between shift and no shift, but the exact definition doesn’t really matter. 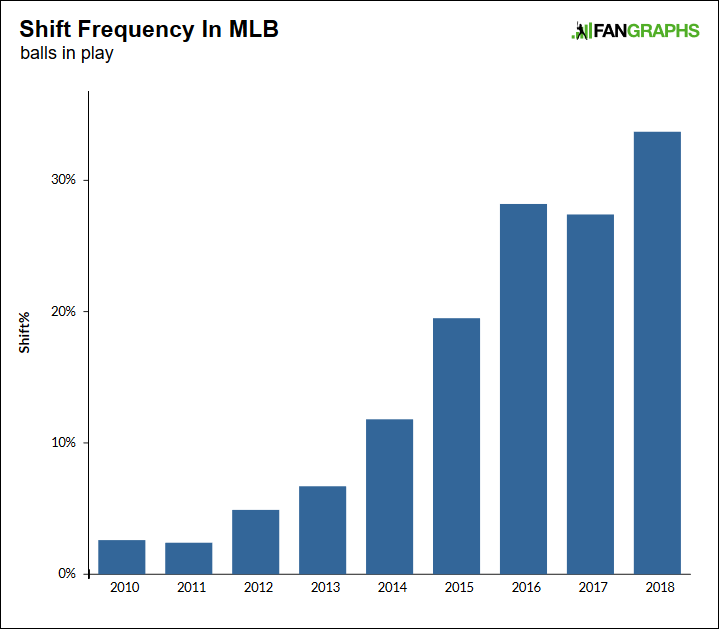 Shifts are way up, compared to ten years ago. Shifts are way up, compared to five years ago. It’s impossible to watch baseball and not notice, unless you’ve only started watching baseball very recently. The commissioner has been contemplating “eliminating shifts” since the week he took the job back in 2015. And now, we’re hearing, support for that idea is building. At last month’s owners meetings, baseball’s competition committee gave the commissioner “strong” backing to try to “put something in place” to limit shifts, according to sources who spoke directly with members of the committee. So next up, it’s time to run this – and more – past the players’ union. For now, we’re still in the idea phase. No rules have been changed; no left-handed pull hitters have popped any corks. Yet not only has this idea not gone away — it seems to be gathering momentum. Many of us, I think, are beginning to assume we’ll see a pitch clock. Perhaps it’s inevitable we’ll see changes here, too. Maybe in time for 2019! Probably not in time for 2019, but sometimes these things move with haste. The actual rule-writing would be complex. There would have to be definitions, where no official definitions presently exist. Baseball’s rule book hardly says anything about where the defenders are supposed to defend. It seems likely a new rule would require two infielders on either side of second base. But, when does an infielder become an infielder? Could a defensive team move an outfielder into the shallow outfield grass? Could teams be allowed a certain small number of over-shifts per game, to be deployed strategically? Ideas are always simple until they’re not. Anything here would have to be careful. In general, I appreciate Manfred’s open-mindedness. I appreciate that he wants to nip things in the bud, before they become problems. It ought to be a good thing for a major sports league to have a proactive commissioner, as opposed to a reactive sort. Other leagues make meaningful changes with some frequency. Baseball needn’t be any different. We’ve gotten used to replay review, as you’ve noticed. We’ve seen a new collision rule. We’ve seen a new slide rule. It’s good to be willing to be creative. Baseball isn’t perfect, and it’ll be pulled in some weird directions, and Manfred is to make sure the game remains entertaining and familiar. I like that the commissioner talks about this stuff. I like that he’s thinking. I’m just not sold on the shifts idea. Maybe I’m just not seeing the right evidence. And I know that the shift has come on quickly. The league, though, wants to increase action. I’m not sure the shift has decreased action, and there’s even the chance this could backfire. The shift has exploded as a tendency within the past decade. Which makes sense, after all — this is the information era. Looking at the numbers, we could try to get super detailed, but it’s good to stay simple if you can. 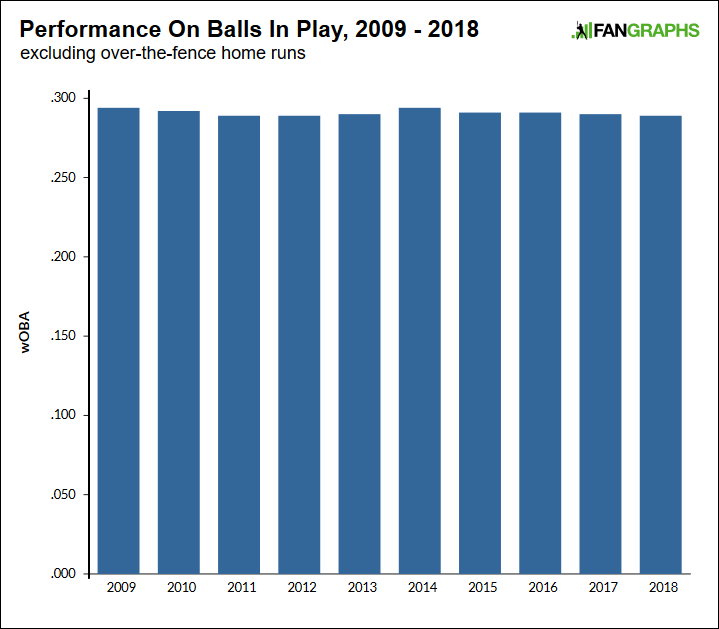 In the following plot, you see overall league batting average on balls in play over the past ten years. I’ve also included batting average on grounders alone. Things are…fine. More or less unchanged, through this lens. Now, it’s important to understand we don’t have the counterfactual. Maybe without so many shifts, the numbers would’ve gone *up*. Teams all have a lot of information, and given that teams shift more than ever, they must think it’s doing something. Intuitively, it feels like it should be doing something. It’s weird we haven’t seen bigger changes. But the numbers are what the numbers are. For as much as we’ve seen an explosion of shifts, they haven’t been swallowing up balls in play. The hits are still out there, as long as you make contact. Individual hitters have been hurt, sure. Certain pull-minded lefties have arguably lost dozens of hits. So, in recent years, have certain pull-minded righties. Eliminating shifts could make things better for those guys. But baseball is a zero-sum game, and if you work to improve conditions for one set, you’re hurting some number of others. What about the other kinds of hitters? What about the pitchers facing the hitters? What right does baseball have to prioritize the Kyle Seagers of the world? A big part of the thinking has to do with the mindset. That is, there’s a psychology at play when a hitter sees a shift. So the thinking goes, when a modern hitter sees three or four infielders on one side, that hitter decides to try to hit the ball over everybody. There’s concern all the shifting has focused attention on higher launch angles. The theory then suggests that high-launch-angle, uppercut swings lead to more strikeouts. Now, for one thing, launch-angle hitters don’t necessarily always strike out more often. Daniel Murphy seldom strikes out. Justin Turner seldom strikes out. And for another thing, think about what would actually be happening under a new rule. More room would open up on the pull side. A greater number of pull-side grounders would sneak through for hits. The idea is that this would incentivize grounders and contact. But do you know who hits the most pull-side grounders? Fly-ball hitters. Or, if you prefer, launch-angle hitters. Here’s a simple scatterplot for the past three years. On the y-axis, overall ground-ball rate. 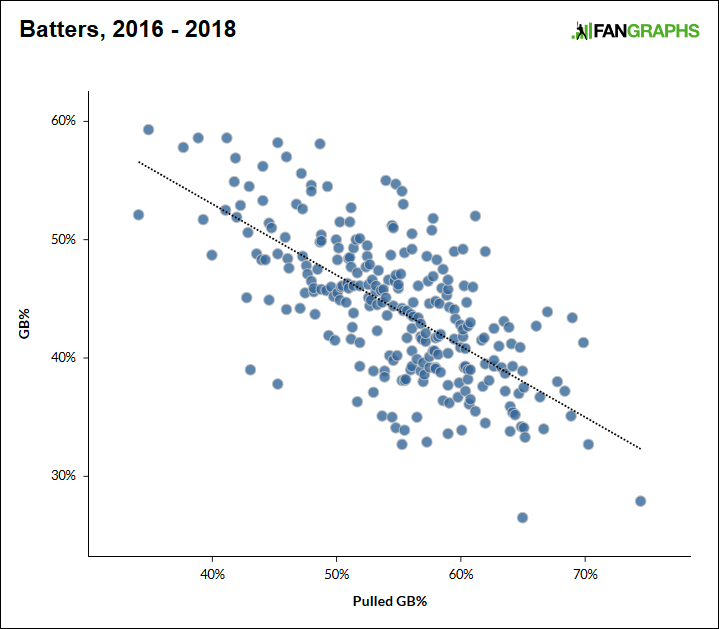 On the x-axis, the rate of grounders hit to the pull side. Pulling or spraying mostly comes down to an individual’s swing. The idea of the rule would be to move defenders from the pull side to the spray side. It seems like that would actually disincentivize trying to hit the ball the other way. By incentivizing pulled grounders, you also effectively incentivize pulled air balls, and just air balls in general. If baseball believes that trying to hit the ball in the air goes hand-in-hand with swinging and missing, it feels like this would only work against them. Of course, we can’t know all of the actual consequences. Which, as it happens, is one of the dangers. Eliminating shifts would increase the importance of infielder range. Maybe teams would look for rangier infielders. Maybe those more athletic infielders would also be more contact-oriented hitters. I don’t know. There’s a lot. There’s a lot I can’t even imagine. But if baseball is concerned about action, or pacing, I don’t know what killing the shift would accomplish. Some events would play out differently, yes. But it’s not like fly balls are out of control. Compared to a decade ago, league-wide ground-ball rate is down exactly one-tenth of one percentage point. It’s basically hovered between 43 – 45%. Eliminating the shift could well incentivize more fly balls. If baseball’s worried about action, I don’t think the issue is the shift. I don’t think the issue is the hitters. The issue is the pitchers. The big trend in baseball has been the rise of the strikeout. Balls in play are less frequent than ever. And, over the past decade, the average fastball has gotten faster by a tick and a half. The average slider has gotten faster by about a tick and a half. The average curveball has gotten faster by more than two ticks. And the rate of sinkers has dropped five percentage points, with breaking balls making up the difference. The run-prevention side already has the information advantage. And the run-prevention side also has the stuff advantage. Every team now has a number of guys who can reach the high-90s, and some of those guys also have wicked secondary pitches. Sometimes those secondary pitches behave like primary pitches! Pitchers are throwing just incredible pitches, and they’re all gunning for strikeouts. Hitters have done an admirable job of trying to adapt, but there’s only so much time hitters have to react to a thrown baseball. That amount of time continues to shrink. Hitting is hard. Hitting has become harder than it’s ever been. Guys who pitch to contact are going away. The starting pitcher is going away. Now, even at this level, hitters can get used to the stuff. There’s still enough offense in the big leagues. And younger hitters are going to be coming up, guys who’ve seen great velocity, guys who’ve seen defensive shifts. Some of them will have learned to hit the other way. It’s always a push and a pull. As things stand right now, I don’t think Major League Baseball needs to adjust the rule book. Not the part about the defense, anyway. And if baseball does have an appetite to change the game’s results, I think the sport would be better served by either lowering the mound, or moving it back. It’s the pitchers who are causing the strikeouts. It’s the hitters who just try to survive. We hoped you liked reading Banning the Shift Is a Solution in Search of a Problem by Jeff Sullivan! Thank you for bringing logic to the discussion. Banning the shift makes so little sense when the stated goal is increasing balls in play. I’m very much on the “lower the mound” train. The fewer BIP is directly related to pitchers being far better than they ever have. Make them a little less effective in a way that already has precedent in the history of the game. It feels so obvious. They didnt just lower the mound though. The also shrunk the strikezone which probably had as big of an effect, if not more, than lowering the mound. Before 1969 the strikezone went from the hitters knees to a his shoulder! My totally unscientific hunch is that lowering the mound a few inches wouldn’t really change things significantly. Obviously it would depend on how much the mound would be lowered, but speaking from experience pitchers velocities are usually 3-6 mph lower when throwing off of flat ground compared to a mound. If it’s a sizable change to the mound a 4mph drop in average velocity would not be crazy. This would most likely have a large impact on strikeout rate (Think about individual pitcher after losing 4 mph from fastballs, their k rate usually plumets). An unforeseen consequence to could be flatter fastball planes that could get more wiffs up in the zone. So that might offset some of the strikeout rate decrease. Interesting fact: in 1968 the league K% was 15.8%. In 1969 after they lowered the mound 5 inches and changed the strikezone the league K rate dropped to…..15.2%. It slowly went down until it bottomed out at ~12% in the late 70’s/early 80’s but by 1986 the K rate was back up to pre mound change levels (15.4% in 1986). The BB% rate however jumped 1.5% (7.6% to 9.1%) from 68 to 69 though which is the largest season to season jump in BB% in the past 50 years. And it has stayed at close to that level ever since. Here here for moving the mound back to the center of the diamond. Put me on the “lower the mound” wagon as well, though I’m a bigger proponent of moving it back (since that brings safety benefits in addition). Either way though, I agree, this is a great article, and restricting “the shift” is a terrible idea. Have the pitcher throw from second base. The infield dirt would get a little crowded, so just ditch the position of second baseman. To keep the nine batter line-up, all pitchers hit AND all teams have a DH [the guy designated to hit for the 2B that doesn’t exist]. Feels like you’re knocking the ‘ban the shift’ as a solution bc some data was introduced here (that we aren’t sure has direct causality) while the ‘lower the mound’ solution has to be the answer just because! I don’t think anyone should pretend they know the answer for what will happen when/if shifts become limited. Seems to me this is worth implementing as an experiment in the minors or AFL so that we can really see what will happen because I not down with the ‘bury your head’ crowd on the lack of balls in play. I think it’s reached the critical stage as far as decreasing action in most games. How do you figure? I watch lots of baseball and the shift doesn’t have much effect IMO other than creating a few hits per night. Baseball is boring because pitchers don’t throw strikes and hitters don’t make contact… well that actually doesn’t bother me – taking a 30 second break for every close play and the absurd replay process does though. You are thinking that banning the shift will make the game more exciting? I don’t really see how a few pull-side ground-balls making it through the infield (best case) is going to make things much different. Yes, more ground balls means defenders having to make plays and putting runners in motion does make the game more interesting. I don’t think this is all that complicated. Otoh, teams probably didn’t react (from a strategic standpoint) perhaps as initially expected… which is to say, many thought that teams would have players expressly try to hit to the vacated areas of the field, if not just bunt for hitz! However, the players themselves are saying that they believe it’s more efficient for them to simply try to hit *over* the shifted defenders, rather than away from them. Moreover, I originally expected teams to try to develop and promote players who made more contact as a means of reacting to the increase in pitcher strikeouts. But instead, we’ve seen the game move toward hitters that can score runs with fewer swings… iow, an attempt at being more efficient – if batters will make less contact, then they have to do more damage with the contact they do make. I’m not so sure that we won’t see an attempt made to move in the other direct – the one I expected to see – toward players like Jeff McNeil, who K less and put the ball in play more. Those players have been a little harder to find the past few years but that prob has a lot to do with team philosophies being in the other direction. Once teams make an effort to prioritize contact, we will see more of this type of hitter and the quality of the game could swing yet again toward more balls in play. Going back to the point above, I don’t know that lowering the mound is going to yield more balls in play. Not sure what evidence suggests that. I think pitchers and hitters are worse than they have been in a long time. We like to think that we are witnessing greatness, but that isn’t a certainty. I think players are better at drills than they have ever been before and they produce excellent measurable, but that isn’t exactly baseball. The NFL has lots of clear examples of guys that are great athletes, but not so good at actual football. I think that is where we are at in baseball right now. Its not a popular opinion and I understand that, but if you don’t embrace the possibility of it, then they almost certainly will get worse over time and nobody will notice. 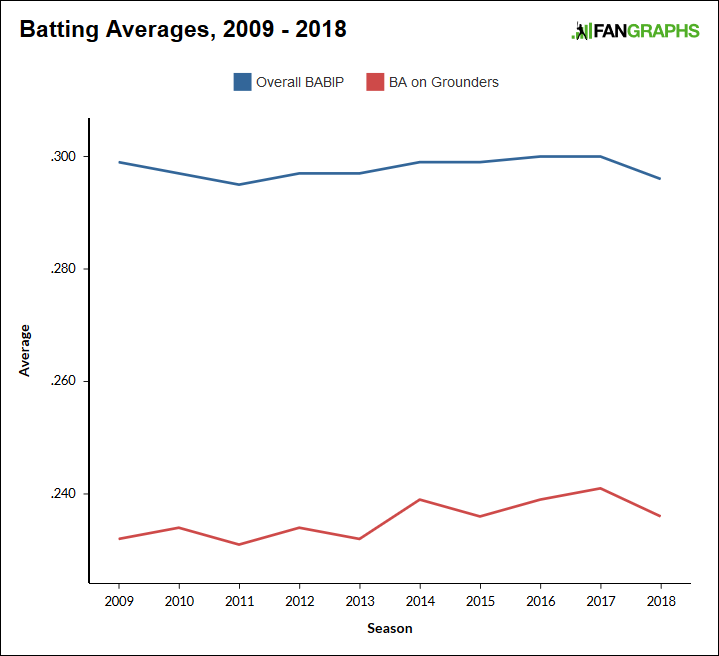 Defensive play is certainly not improved, base-runinng is certainly not great, pitchers don’t throw a ton of strikes and hitters don’t make much contact… if not for juiced baseballs and an enlarged strike zone we probably might have some different ideas about where we are on the curve!